I used to keep lists all the time - lists of the things I needed to get done, lists of the clothes to pack when going on a trip, etc. Then somewhere along the line I stopped making those lists. I kind of made them in my head, but I quickly found out that didn't work too well. I'd think of something I needed to get done, think to myself that I needed to be sure and remember, and then I'd promptly forget. I'm not saying I never got anything done, but I know I forgot plenty. Recently I have started making lists again - after several months (or longer) of telling myself that I really needed to start writing things down again. I'm sure I don't write every little thing down that I maybe should, but I've been trying. It is kind of satisfying to be able to check things off when I actually get them done. Today I was thinking about - not writing down yet - all the things I need to get done around the house. I started listing bathrooms that need cleaned, furniture that needs dusted, floors that need swept, vacuumed and mopped, shirts that need ironed, food that needs cooked, etc. I started wondering if it would be easier just to make a list of the things that don't need done! Of course, that would take away the satisfaction of checking off the things that I get done, and I can't think of a single thing to put on that list of things I don't need to do. 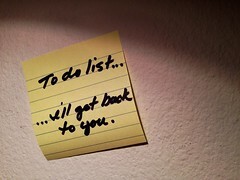 How's your to do list looking?